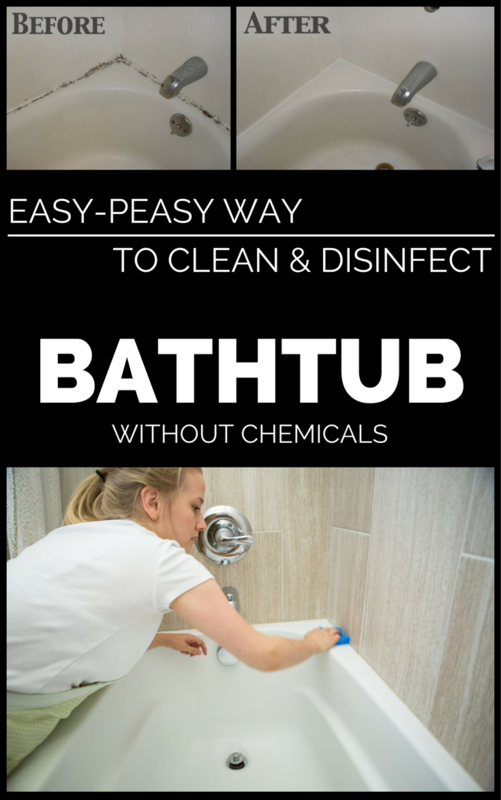 Are you tired in rubbing the bathtub with all sort of chemicals, and the results disappoint you? Not to mention that they harm your health very badly. The following tricks and natural remedies, not only it will help you to clean and disinfect the bathtub, but they also remove limescale and other hard-to-remove stains. Baking soda is a great ally in all household chores, but when it comes to cleaning it is one of the best ingredients you can use. Combined with vinegar or lemon juice, it has exceptional properties and does wonders when it comes to removing stains from the bathtub (sink and toilet bowl) surface. Mix 1 or 2 tablespoons of baking soda with vinegar or hydrogen peroxide. Add the liquid a little at a time to form a paste. Apply the paste over the stained areas or use a thick brush to rub the stains. Let the mixture act for an hour then rinse with water. Vinegar. Fill the bathtub with hot water and add three liters of vinegar and 4-6 tablespoons of baking soda. To get the desired results, leave it for a few hours to act. Vinegar will disinfect the bathtub, and baking soda will make your bathtub shiny new. Once the mixture has drained, rub the bath with a little shampoo and a sponge. Wait again and the bathtub will shine. The acrylic bathtub can be cleaned with lemon juice! Mix the juice from a lemon with a cup of water. Add some dish detergent and use the solution to clean the tube, and rub the stained areas with a soft cloth. Rinse the tube after 1 hour. This seems to be the best way to clean the acrylic bathtub. It’s very important to do this procedure weekly to get great results. The cast iron tube is excellently cleaned with chlorine. Chlorine simply bleaches the cast iron and gives it glow. On the other hand, chlorine is toxic and the process generates toxic gases. An alternative is hot vinegar and coarse salt. Rub the tube with salt after dipping it vinegar. Rinse with hot water after words.